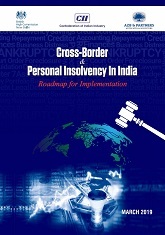 British High Commission, CII and AZB & Partners’ Report on Insolvency, titled “Cross-Border & Personal Insolvency in India: Roadmap for Implementation”, March 2019, mentions NLUD’s contribution on page 4 of its Report. The report acknowledged contribution of Dr. Risham Garg, Associate Professor & Director, Centre for Transnational Commercial Law, National Law University Delhi; who was assisted by Research Interns Priyal Garg and Debaranjan Goswami, NLUD. Dr. Risham Garg served as an external consultant to the project funded by British High Commission, who also conducted a session on ‘Cross-Border Insolvency’, in a training workshop for Government officials and insolvency professionals.